Vengeance wreaked. No evidence of Palestinian guilt. The Fogel family were stabbed to death in the illegal settlement of Itamar. It is likely the culprit was a Thai worker who had not been paid his wages. Today the village of Awarta, near Nablus, is facing the second day of a severe curfew imposed by the Israeli military, following Friday morning’s murder of a settler family in the settlement Itamar. Three ISM activists–Cinda, 23, Chad, 25, from Sweden, and Cissy, 53, from Norway–are currently trapped in the village. Anyone caught stepping outside of their house is arrested. Soldiers have said that they’ll maintain the curfew until they’ve apprehended the settler family’s murderer. The army hasn’t presented any evidence that the murderer was from Awarta, and villagers have said to the ISM that they strongly doubt the murderer was even Palestinian as the settlement is so heavily guarded it would be impossible to break in. Soldiers are beating people and continuing their house raids: destroying houses from the inside, cutting off electricity, and polluting the drinking water by throwing mud in the water-tanks. 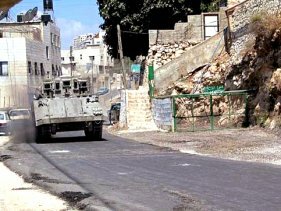 30 homes were occupied by soldiers last night. Computers and ph ones have been destroyed and money and property were stolen by the soldiers. In the last two days soldiers have been throwing sound grenades inside and outside the houses, and shooting in the air. The ISM activists may be arrested soon, but they intend to stay as long as possible because they feel their presence improves the behavior of the soldiers, and villagers have asked them to stay. As of 12:30pm the ISM activists are locked in a room with the children of the family that they’ve been staying with while soldiers search the house. They've heard an unconfirmed report that 100 village men were taken into detention at the school for interrogation a few hours ago.